Gorgeous old color Vaugondy map of Belgium and Luxembourg. Pays-Bas Catholiques où sont distinguées les Limites de la France qui comprennent le Comté d'Artois, partie des Comtés de Glandre et de Haynaut, et du Duché de Luxembourg. Par Sr. Robert Geographe ordinaire du Roy. Avec Privilege. This is a beautiful old color 1751 Gilles Robert de Vaugondy map of Belgium and Luxembourg. The map is centered on modern-day Belgium and includes Luxembourg, as well as northeastern France, which borders both Belgium and Luxembourg. 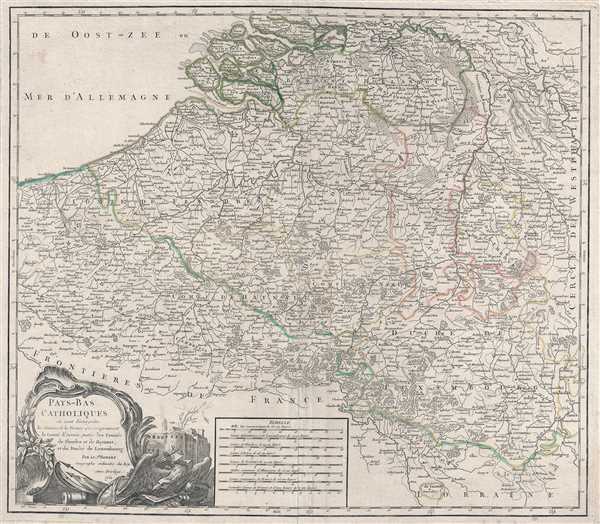 The map also illustrates the southern Netherlands (Brabant Hollandois), and western Germany (Westphalie). The map is highly detailed and names myriad towns and villages, as well as major cities, like Bruges, Brussels (Bruxelles), Liege, Dunkirk (Dunkerque), and Calais. The map also labels different regions, including Artois and Lorraine in France, and Namur and Flanders (Flandres) in Belgium. There is a beautifully engraved title cartouche in the lower left corner, surrounded by an eagle and instruments of war, including a shield, spears, and an axe. Behind the eagle, a walled town is depicted in profile. Drawn by Gilles Robert de Vaugondy in 1751 and published in the 1757 issue of his Atlas Universal. Good. Minor soiling. Centerfold reinforcement. Blank on verso. Original pressmark visible.